It’s that fantastic time of the month again, the time where I talk about product dupes, I really love doing these because it’s always nice to know if you can get a product for less or if it’s just not worth it. Last month was all about blushes and this month is about eyeshadow, I’ll be putting Modern Renaissance up against some Makeup Geek shades. I was inspired by this photo that I saw on Pinterest, which I did not do all of the shades as I just wanted to do this shades that I already owned, so today we will be talking about five of the shades. If you guys are really interested in seeing more dupes from the Modern Renaissance I might do the rest sometime in the future, but for now, I’m doing five, so let’s get into it. It’s the last Sunday of the month of August, which means it is time for my final season and my final palette review, in case you want to see last weeks, which is Autumn of course, and if you want to see them all, that one should link you to the week before and that one the one before so you can see all of the seasons. For winter I’ve settled on the Anastasia Beverly Hills Subculture Palette, a very talked about palette that I did purchase the day it came out, I was excited and just couldn’t wait. So, I have had this one a while but have been sitting on the review as I wanted it to be my winter palette and I wanted to make sure to have a nice amount of time to play with it. Let’s get on into it. I didn’t see any reason in sharing the box that this came in because it looks exactly like the palette packaging itself. I have mixed feelings about the packaging, just like my Modern Rennasiance palette, I like the look of it but I kind of hate the feel of it, I just don’t much care for the feel of velvet combined with the fact that it feels like a type of material that would get dirty really quickly, even if it is dark. Now, this palette has been getting a lot of feedback about it being too powdery and impossible to blend, I do not agree with that completely. The formula of the matte shadows are very powdery, but I personally don’t think they give off much more kick back than my Modern Renaissance palette does. The shimmers are a different story, the shimmers are much different than the ones in its sister palette, those one are creamy and amazing but these ones are just hard to work with. I’ve found cube does pretty well as an inner corner highlight, it’s impossible to work with otherwise though. Adorn and Electric are really similar in texture, I find that both of these can be worked with alright but I pretty much have to apply them with my fingers, which for me isn’t that big of a deal but I know for some they don’t want to do that. The formula of that mattes is amazing though, they are a big powdery and a little bit harder for me to work with than their sister palette, but boy do they pack a punch of color and that is something that I really love. Now, to talk about the swatches, we are going to go from top to bottom of course. Cube, which you pretty much cannot see, is a light shimmer white kind of colors. Dawn is a really pretty matte, light reddish brown, it’s really quite pretty. Destiny is the perfect dark, matte army green shade. Adorn is a really pretty copper shimmer shade. All Star is one of the stars of this palette if you ask me, it’s a deep blood red matte shade that is just stunning. Mercury reminds me a lot of a really dark taupe kind of shade, it’s interesting for sure. Axis is a really pretty deep matte marine kind of blue, it looks a lot like the marine shade I saw often when looking and bridesmaid dresses. Roxy is a confusing shade if you ask me, it looks light and sherberty in the pan but swatched and on the eye, it is a lot brighter. Electric is pretty interesting, you can barely see it here and it almost looks silver with a green flash to it but it is way more interesting than that, I’m not really sure how to describe it but it’s green, shimmery and really pretty. Fudge looks exactly how I would think it would, a pretty dark red brown. New Wave is one of my favorites as well, it’s a gorgeous matte pumpkin kind of shade. Untamed is a really dark forest green, it’s really similar to Axis but less blue and more muted. Edge is one of the more interesting colors in this group of shadows, it’s kind of a mustard shade and that’s not a common shade, however, I personally love the look of it. And finally Rowdy, which is a really deep, dark purple shade, a blackened plum if you will, it’s very pretty but it almost looks black. I had a little bit of trouble with this palette, there is a bit of a learning curve when it comes to the application with this one, however, I think it’s something that I’m doing alright with. Anyway, these are the three looks that I came up with and they feature some of my favorite shades; Electric, Axis, Edge and All Star to name a few. 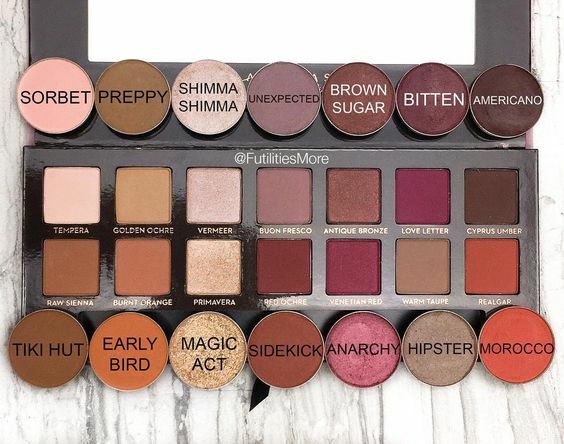 I feel like this palette has a great selection of shades, and while they are a tiny bit random it makes for a ton of versatility in looks and that is something that I quite enjoy. I feel like I sound like I hate this palette by talking about the fact that it is a little harder to work with than other eyeshadow palettes that I’ve tried, however, I actually quite enjoy this palette. If I’m being honest it isn’t my all time favorite eyeshadow palette, but it’s not my least either, and I personally do not regret picking this one up one bit. I think I need to play with it a little bit more, but overall I am satisfied with all of the looks I’ve created and I enjoy this one. Did you guys enjoy seeing a palette review every week? I know I just did a makeup look of sorts the other day, a full face using only Nyx brand makeup, but I’m back with another makeup look. As you may know, I’m getting married this year and we’re thinking about doing engagement photos, so I’ve been thinking about what to wear, how to do my hair and things like that, which means I’m going to show off what looks like will be my makeup for the photos. We will be taking photos outside and it’s going to be fairly casual, so I didn’t over do it and kept it fairly simple I think. Let me show you what I’m thinking about doing. I like this look, I think this is a really simple but fresh look, I think this is something that I could wear just about anywhere, in fact, I wore it to work the other day and I think it was even perfect for that. Granted, where I work no one really seems to care what I wear in terms of makeup, but I still think this is overall a really work appropriate makeup look. Now, here’s some close ups of the eye and then I’ll list all of the products that I used down below it. And that is everything that I used, a really good mix of high end and drugstore products, along with some new things which you may know if you saw my huge Ulta Haul I posted on Tuesday, I was itching to try out at least a few of the new things and they seemed like perfect fits here. So far, I like everything but I’ll have more in-depth reviews of products at some point in time.